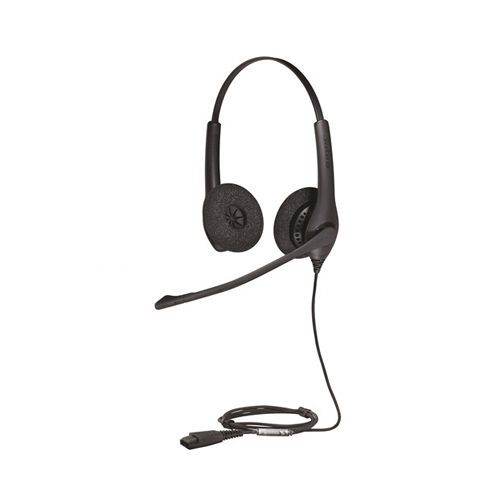 The Jabra BIZ 1500 Duo QD Corded headset features noise-canceling capabilities eliminating unwanted background noise. Peakstop™ instantly removes any harmful loud sounds before they even reach your ears. This keeps the sound level in the safe range and protects your hearing. 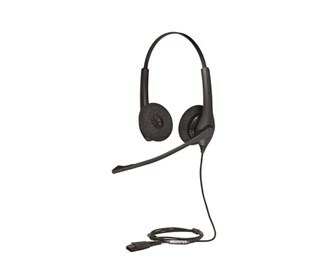 This is an entry-level, low cost professional corded headset built for cost-conscious contact centers. The Jabra BIZ 1500 also features a 270 Degree boom arm for easy adjustment and durability and foam ear cushions to keep your ears cool all day long. With noise cancellation technology, background noise is reduced providing a more professional customer experience on every call. The Jabra BIZ 1500 Duo QD has many exciting features for users of all types. You can extend the lifetime of your Jabra BIZ 1500 Duo QD with the purchase of a FactoryOutletStore Factory Protection Plan. See the Jabra BIZ 1500 Duo QD product video and gallery images above for more details. The Jabra BIZ 1500 Duo QD is sold as a Brand New Unopened Item.